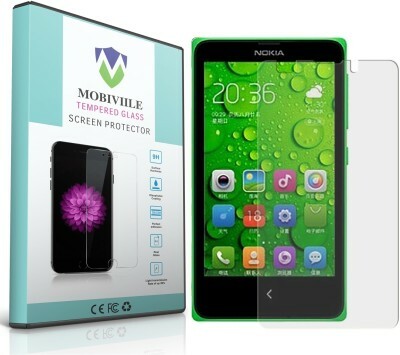 MOBIVIILE Presents MOBIVIILE �Nokia XL Dual SIM RM-1030 Screen Guard\" Tempered Glass Screen Protector - An Invisible Shield That Will Save Your Phone From The Hardest DropsWhy MOBIVIILE�s Nokia XL Dual SIM RM-1030 Screen Glass - Tempered Glass Screen Protector Is A Must Have For Your Phone:� Most importantly, because it's an investment! Investments are generally meant to generate money. MOBIVIILE features the FINEST QUALITY Nokia XL Dual SIM RM-1030 high level hardness, it makes your Smartphone INVULNERABLE to scratches and accidental drops (Anti-Scratch / Anti-Glare Screen Protector). Even knives and keys can't scratch your phone's screen when you have protected it with MOBIVIILE �Nokia XL Dual SIM RM-1030�!� It is anti-scratch and provides you with 99.99% clarity and touchscreen accuracy! In addition, its special coating offers fingerprint resistance.